(Nanowerk News) In a darkened, hangar-like space inside MIT’s Building 41, a small, Roomba-like robot is trying to make up its mind. Standing in its path is an obstacle — a human pedestrian who’s pacing back and forth. To get to the other side of the room, the robot has to first determine where the pedestrian is, then choose the optimal route to avoid a close encounter. As the robot considers its options, its “thoughts” are projected on the ground: A large pink dot appears to follow the pedestrian — a symbol of the robot’s perception of the pedestrian’s position in space. Lines, each representing a possible route for the robot to take, radiate across the room in meandering patterns and colors, with a green line signifying the optimal route. The lines and dots shift and adjust as the pedestrian and the robot move. This new visualization system combines ceiling-mounted projectors with motion-capture technology and animation software to project a robot’s intentions in real time. The researchers have dubbed the system “measurable virtual reality (MVR) — a spin on conventional virtual reality that’s designed to visualize a robot’s “perceptions and understanding of the world,” says Ali-akbar Agha-mohammadi, a postdoc in MIT’s Aerospace Controls Lab. Agha-mohammadi says the system may help speed up the development of self-driving cars, package-delivering drones, and other autonomous, route-planning vehicles. The system was developed by Shayegan Omidshafiei, a graduate student, and Agha-mohammadi. They and their colleagues, including Jonathan How, a professor of aeronautics and astronautics, will present details of the visualization system at the American Institute of Aeronautics and Astronautics’ SciTech conference in January ("MAR-CPS: Measurable Augmented Reality for Prototyping Cyber-Physical Systems"). The researchers initially conceived of the visualization system in response to feedback from visitors to their lab. During demonstrations of robotic missions, it was often difficult for people to understand why robots chose certain actions. “Some of the decisions almost seemed random,” Omidshafiei recalls. 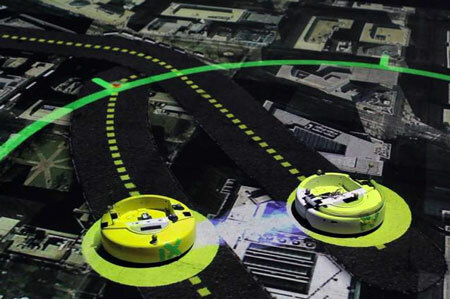 The team developed the system as a way to visually represent the robots’ decision-making process. The engineers mounted 18 motion-capture cameras on the ceiling to track multiple robotic vehicles simultaneously. They then developed computer software that visually renders “hidden” information, such as a robot’s possible routes, and its perception of an obstacle’s position. They projected this information on the ground in real time, as physical robots operated. The researchers soon found that by projecting the robots’ intentions, they were able to spot problems in the underlying algorithms, and make improvements much faster than before. The group has explored a few such applications using the visualization system. In one scenario, the team is looking into the role of drones in fighting forest fires. Such drones may one day be used both to survey and to squelch fires — first observing a fire’s effect on various types of vegetation, then identifying and putting out those fires that are most likely to spread. To make fire-fighting drones a reality, the team is first testing the possibility virtually. In addition to projecting a drone’s intentions, the researchers can also project landscapes to simulate an outdoor environment. In test scenarios, the group has flown physical quadrotors over projections of forests, shown from an aerial perspective to simulate a drone’s view, as if it were flying over treetops. The researchers projected fire on various parts of the landscape, and directed quadrotors to take images of the terrain — images that could eventually be used to “teach” the robots to recognize signs of a particularly dangerous fire. Going forward, Agha-mohammadi says, the team plans to use the system to test drone performance in package-delivery scenarios. Toward this end, the researchers will simulate urban environments by creating street-view projections of cities, similar to zoomed-in perspectives on Google Maps. Because the Federal Aviation Administration has placed restrictions on outdoor testing of quadrotors and other autonomous flying vehicles, Omidshafiei points out that testing such robots in a virtual environment may be the next best thing. In fact, the sky’s the limit as far as the types of virtual environments that the new system may project. “With this system, you can design any environment you want, and can test and prototype your vehicles as if they’re fully outdoors, before you deploy them in the real world,” Omidshafiei says.